Privacy or, according to the Donmar’s listing, PRIVACY. Pri-vacy or Priv-acy. In James Graham’s latest play, which follows the unexpectedly huge success of this This House at the National, everything is up for debate. Indeed the amount of audience interaction and feedback means far more democracy is on display in Privacy than in This House’s exploration of parliamentary backchannel deal-making. It does Privacy a disservice to think of it as a ‘play’; judging against these criteria one has to acknowledge that the fictional narrative is rather slight. The idea of a playwright writing a play about the subject and entering Socratic dialogue with those he encounters is lazy for a playwright at this level. We have been living in post-modern culture for over a quarter of a century and this is approach is pretty much meta-101. From a purely textual perspective Privacy is also hindered by the fact that this fictional plot is far less interesting than the people he talks to and the subjects discussed. Privacy may be sold as a play but in truth it is less play and more a fascinatingly structured lecture that has been fictionalised. It is not dissimilar to the most entertaining TED Talks and the purpose of the evening is more edutainment than anything else. In this environment the characters of writer, director and psychiatrist are entirely secondary to, and at the service of, the relying of information from source to audience. The structure is familiar to Black Watch; it interweaves verbatim dialogue with dramatized situations. It is unclear how much, if any, of Graham’s work comes from first hand interviews and what has been lifted from other sources, for instance much of the detailing of the Guardian’s involvement in the Snowdon affair and in the destruction of the hard drives felt as if it had been previously recorded elsewhere. This weaving of sources is an entirely appropriate academic technique for synthesising information but without the accompanying intellectual rigour it leaves the production open to criticism over how it represents its material. Theatre does, and should, present partial viewpoints; it is not the role of theatre to present unbiased reportage. Indeed the best verbatim theatre – the tribunal plays produced at the Tricycle under Nicolas Kent – used unbiased reportage to create a clearly partial view. However Graham’s play sits in a grey area where we are invited to take a view on how shocking it is what the government and big business get up to, and we are meant to feel it is strengthened by including ‘real experts’ speaking ‘real dialogue’. It is a fast-paced and highly enjoyable journey but on reflection doubts over whether it is a substantial whole begin to creep in. It is a rather superficial gaze on the issues – perhaps reflected in the fact that many of the accounts are given by politicians, journalists and the omni-present Shami Charkrabarti, pretty much the epitome of the liberal media darling. These are all people used to speaking in sound bites, regurgitating complex issues into digestible chunks. There is a distinct absence of voices from the technicians who build the programmes and from the people who use them. If this is a play about how people are sleepwalking into a surveillance state there was precious little from the people themselves. Early on they identified that they needed to make the play not about middle-class, white people (oh and how the Donmar’s audience chuckled indulgently at this) but in reality the voices we hear only reinforce the patrician attitude of the political-cultural elites towards the masses. 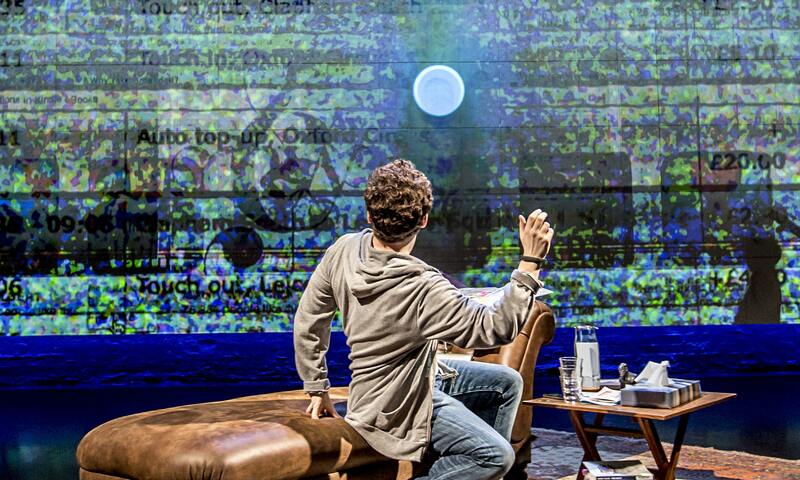 The play also skimmed over the potential of big data for improving people’s lives, and that we cannot both opt-out of data collection whilst still benefiting from its potential. Care.data is mentioned briefly but does not touch on the huge significance of the project and its potential to improve the life chances of society’s most vulnerable people. Importantly these are not just Government-led changes, those who work in public policy are increasingly pro-big data and are encouraging individuals to take this data and make what they want of it. London has its own data store and the wealth of information has led to some fascinating designs that are for the benefit of everyone. This is the true democratisation of information. 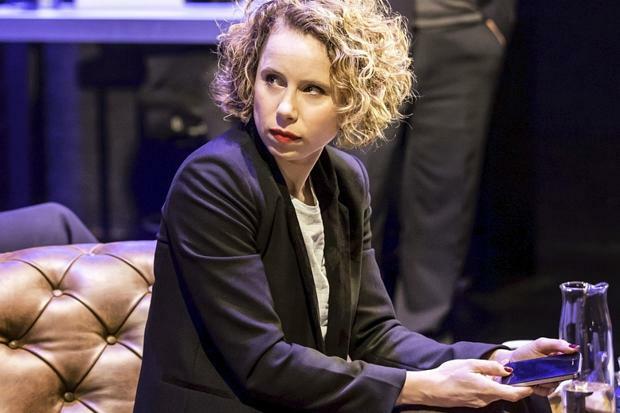 These quibbles do limit the lasting impact of the play but it is does not stop Privacy being a hugely enjoyable night out. The visual and technical effects are absolutely central to the play and bring the information alive. Many of the concepts are quite abstract but to have them demonstrated live is an impressive and engaging tool. 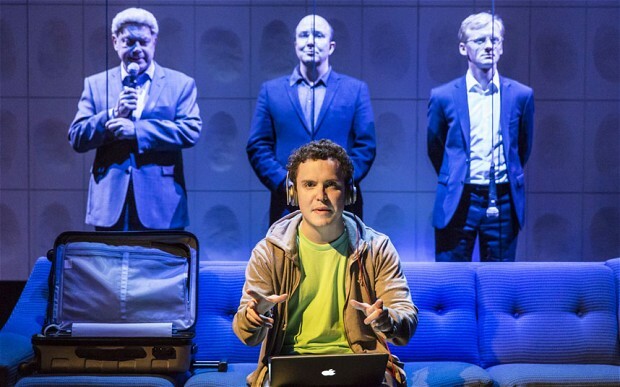 It is the only show I have seen that requires an on-stage ICT support desk and it is a virtuoso performance in itself to keep up with the rapid pace of the piece. Graham also has a suitably mischievous spirit and he uses The Tempest to talk about the increasingly verbose nature of T&Cs. It is a cute choice; watching what can be achieved through technology does take on the air of watching a modern-day Prospero work his trickery. It is also hard to think of The Tempest without alighting on ‘O, Brave New World’; a line that has traversed its origins and become shorthand for dystopian future worlds. Throughout the production we are continually forced to ask whether we are already living in the future that we had imagined. The fluid and dynamic interaction between smart phone users and the live play generates questions about the nature of theatre and the relationship between audience, actor and author. It is not the place of Privacy to unpick these questions but in the way that participatory theatre has increasingly blurred boundaries between performer and audience, the team of Anthony Lilley, Duncan McLean and Valentina D’Efilippo working under Josie Rourke’s confident direction have begun an important conversation about how technology may drive change in our theatrical experience. Or it may be the internet equivalent of smell-o-vision. On this we will just have to await the future.